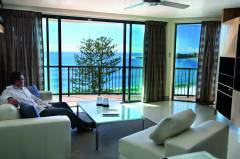 The Peninsular is an award winning beachfront resort with 65 fully self-contained 2 and 3 bedroom apartments all with stunning views overlooking the beautiful Mooloolaba Beach and Bay. Features include 4 onsite restaurants, hairdresser, beautician, jeweller and a range of fantastic boutiques. The Peninsular also features a gas-heated pool, spa, sauna, 3 large BBQ areas, gymnasium and a full-size floodlit tennis court. The Peninsular is situated right in the cosmopolitan heart of Mooloolaba directly opposite the main patrolled surf beach within only a short walk to all boutiques, al fresco restaurants, bars, tours and attractions.